As we unveil more ideas for our Cyber Week Sale, today we are narrowing down ideas for dressing up your envelopes and gift packaging! Writing your address over and over again is so 1990! These days it seems almost everyone has a personalized stamper or sticky address labels that coordinate with their correspondence. There are so many great choices to dress up your envelopes at More Than Paper. Any of these gift ideas are perfect for the organized, for the stationery lover, or Mom. Dress up your envelopes with a personalized stamper from More Than Paper, offered at 40% off retail during this Cyber Week Sale! This is a versatile design that will last you all year long, and can come with a two color ink cartridge for added fun. 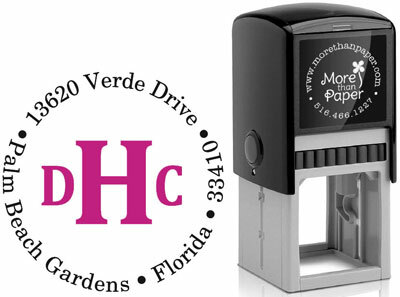 These "labels galore" are fantastic for labeling your envelopes, books, packages and more! The set is available in red or blue and there are many personalizing options. We like this gift option for the stationery lover or someone who would appreciate "dressing up" their packaging - and it is 25% off during our Cyber Week Sale. A really popular item this season has been hanging gift tags. Perfect for dressing up that bottle of wine you are giving as a gift or tie it on to the ribbon wrapped around a package. These colorful tags are a great way to dress up your gift giving this season - and they are also on sale - 25% off. 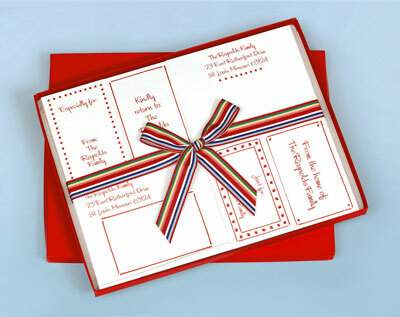 See all of our ideas for dressing up your envelopes and gift at More Than Paper here. Join us tomorrow as we share ideas for dressing up the home!